In this workshop, Collections as Algorithms, we will treat the Reanimation Library and the publications therein as a system of collection, memory, communication, and control much like a machine. In doing so, we will collectively begin to reverse engineer the rationales and rhythms for the mechanistic processes that surround us today. This workshop will use the Reanimation Library as a mode for examining algorithmic decision-making. As we trace the failings, trappings, and benefits of applying an informatics perspective to the analog world around us, we’ll consider how these implications are transferred into and out of emerging technology. 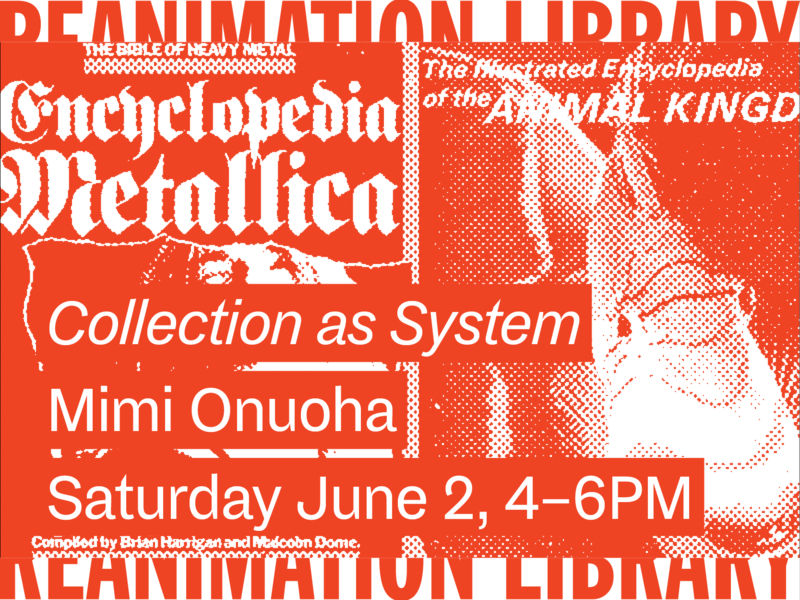 This workshop is one in a series of monthly programs that activates the Reanimation Library, a collection of obscure or out-of-print publications housed at Pioneer Books. Mimi Onuoha is a Brooklyn-based artist & researcher whose work explores missing data and the ways in which people are abstracted, represented, and classified. She is currently teaching at NYU’s Interactive Telecommunications Program and is a Research Resident at Eyebeam and Artist in Residence at StudioXX. She has served on the Visiting Faculty at Bennington College and has been a Data & Society Fellow, Visiting Researcher at the Royal College of Art, and Columbia University Tow Research Fellow.